To present the best information in a single view of Jupiter's moon Ganymede, a global image mosaic was assembled, incorporating the best available imagery from NASA's Voyager 1 and 2 spacecraft and NASA's Galileo spacecraft. This image shows Ganymede centered at 200 west longitude. This mosaic (right) served as the base map for the geologic map of Ganymede (left). The largest moon in the solar system has finally received its cartographic due. Scientists have created the first global geological map of Jupiter's huge, ice-covered moon Ganymede, more than 400 years after its discovery by Galileo Galilei. The map, created using observations by NASA's twin Voyager probes and Galileo orbiter, highlights the varied terrain of Ganymede, which is bigger than the planet Mercury. The new map, which was published by the U.S. Geological Survey (USGS), could also help scientists plan out the search for alien life, researchers said. "After Mars, the interiors of icy satellites of Jupiter are considered the best candidates for habitable environments for life in our solar system," USGS Astrogeology Science Center director Laszlo Kestay said in a statement. "This geologic map will be the basis for many decisions by NASA and partners regarding future U.S. missions under consideration to explore these worlds." Observations of Jupiter's largest moon made since its discovery in 1610 have revealed many features and facts about Ganymede over the centuries. They show that the 3,273-mile-wide (5,268 kilometers) moon possesses dark, heavily cratered terrain as well as lighter, younger regions marked by many grooves and ridges. A geologic map of Jupiter's largest moon Ganymede is superimposed over a global color mosaic of the Galilean moon made of images from NASA's Voyager 1, 2 and Galileo spacecraft. The moon's features have been shaped during three major geologic periods — one dominated by impact cratering, then another marked by lots of tectonic activity and finally a third in which this activity tapered off, scientists said. 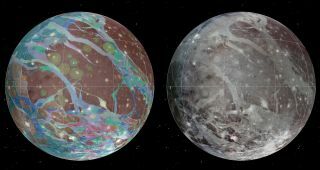 "The highly detailed, colorful map confirmed a number of outstanding scientific hypotheses regarding Ganymede's geologic history, and also disproved others," said Baerbel Lucchitta, scientist emeritus at the USGS in Flagstaff, Ariz. "For example, the more detailed Galileo images showed that cryovolcanism, or the creation of volcanoes that erupt water and ice, is very rare on Ganymede." Voyager 1 and 2 flew by Ganymede in 1979 during their unprecedented solar system "grand tour," then kept on going all the way toward interstellar space (which Voyager 1 entered in August 2012). The Galileo probe studied Ganymede and many other members of the Jovian system while orbiting Jupiter from 1995 through 2003.